I’m a bit of an amateur historian, and I find accounts of daily life in bygone days fascinating – most particularly, aspects of crime and punishment. If you’re wondering why crime and punishment, it’s simply this – hidden in this type of accounting, one can generally find the unvarnished historical truth of social conditions of the time. This is quite an amazing site, and each transcript lays out, by and large, not only the techniques employed to apprehend criminals (from the 1600’s through to the early 1900’s), but an accounting of the trial testimony, and the punishment handed down on conviction. I must admit, I find it difficult to accept, that it was not at all unusual to hang a “criminal” for theft of a spoon for example, according to the early trial transcripts. I mentioned earlier, that I’m interested in the techniques used in those days to identify and apprehend criminals, and unavoidably, I often make comparisons between then, and now. The Internet has had significant impact on both crime, and in a sense, punishment. Here’s what I mean. It’s really only a minor example of the use of the Internet to apprehend criminals but nevertheless, it struck a chord with me. In a community just outside of Toronto over this past weekend, a Husky (typically Canadian, huh? ), was stolen from outside a shop while the owner was buying groceries. Shortly after reporting the theft to the Police, the owner had his faithful companion back. It seems, that when the Police dispatcher heard of the theft, she followed up by subsequently checking out the free online classifieds website, Kijiji, where she spotted the dog which had been offered for sale by the thieves – two brothers, age 14 and 17 . Following a “sting” operation the thieves were arrested. Very cool, I thought – minor, but powerful. The punishment aspect is a little more complex, but it illustrates the power of the Internet, in this case Twitter, to satisfy the needs of those who seek immediate information. The former commander of Canadian Forces Base Trenton, in eastern Ontario, Col. Russell Williams, who was arrested late last year, following a series of horrendous crimes which included a number of murders, sexual assaults, and 80+ additional crimes, appeared this morning before a court to plead guilty to all charges. 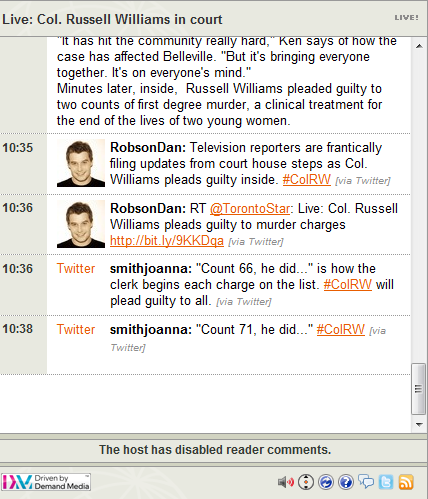 In Canada, where criminal trials are not viewed as entertainment (rightfully so), and cameras are not allowed in courtrooms, a certain sense of urgency by the media to capture the immediacy of the proceedings, was met by employing Twitter to broadcast the details, as the following screen capture of Twitter conversations makes clear. Crime and punishment – the Internet has given new and expansive meaning to both. For a bit of perspective on the past, checkout the Old Bailey site using your own family name. You never know – you might just find a forgotten relative. For those of you who embrace the phrase “once it’s on the Internet, it’s out there forever”, you might be surprised to see, that in fact – once “it’s” been noted virtually anywhere, (even as far back as 17th century England), it’s out there forever. 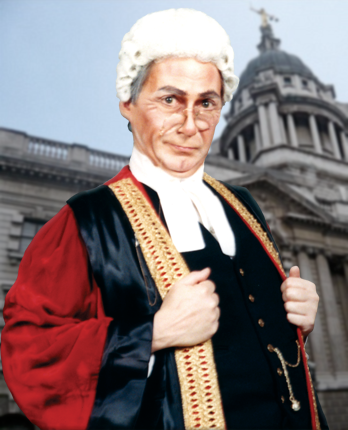 I never knew the Old Bailey had a website of old cases. I’ll have to check that one out. Unless you’ve read it already. Glad you found that interesting. It’s pretty cool, alright. Thanks for the book referral – I’m an avid reader (3/4 books weekly), so I’ve made a note of the book for my next Library visit, this coming week.